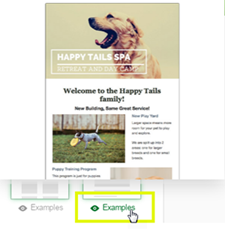 Use a pre-designed template to create and send your next GoDaddy Email Marketing campaign. In the template gallery, hover over Examples below each template design type. This will give you an idea of how each pre-designed template looks with text and images. There are two examples for each template design type. Click the template you want to use. The template opens in the Composer, and you can begin adding your text and images.